Successfully Added Inspection Surveillance Video Camera - Flexible Pinhole Camera to your Shopping Cart. 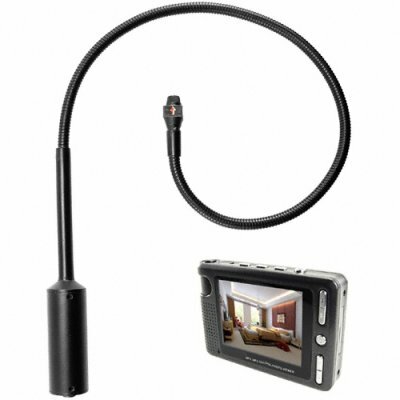 Flexible inspection and under-door video camera for getting into hard to reach places (or even ing on the next room!). Often called a snake or gooseneck videocamera, this omni-directional pinhole camera allows you to see into many hard to reach areas and is small enough to even be slipped under doors! When used as an inspection tool, this flexible camera can see into hard to reach areas such as ceiling plenum's, electrical wall panels, underneath or behind heavy object, etc. The included video receiver / recorder unit (pocket sized DVR with LCD) can view and record all the video from the target area for immediate use as well as later review back at the office. When used as a surveillance camera, it can be mounted where other cameras will not fit and can but used without notice. It can also be used with its metal mounting canopy to be a low profile security or surveillance camera. It has standard AV out connections so it can we wired to the included portable DVR or connected to an existing surveillance system. Our usual Chinavasion low wholesale price makes this product perfect for the resale market, internet storefront, or special personal/company use. As always, it is only available from your source for wholesale direct from China electronic products, Chinavasion. on 2010-04-24 17:39:21 Excellent value for your money! This is a necessary item for investigators (or those interested in discovering a cohabitant-suspect's favorite hiding place for secret contraband): discrete, compact, light weight, and very user friendly. Superior video and audio quality. Can't go wrong!